The AWEX EMI closed at 2016c, down 11c for the week, and posting the first negative week result for the EMI for 2019. Price pressure came on when the weekly national offering increased from early estimates of 36,000 bales to the 49,000 bales. The catalyst was obviously the sharp rise in last week’s EMI drawing wool available for sale forward. Merino Fleece opened weaker (down 25-35c) in Melbourne on Tuesday. Wednesday saw Sydney quickly align to the new price basis and a consolidation of Melbourne’s price. The Final day of selling saw some strength return onto the market right to the close. Merino Skirtings moved parallel to their fleece counterparts. Crossbreds generally found a price support level after accrued rises of 265c for in 2019 for both 28-MPG (+30%) and 30-MPG (+37.5%). Carding Wools were generally slightly cheaper in Sydney and Fremantle. The South African sales progressed this week with the Cape Wool Indicator holding up reasonably well given the absence of China (due to the import ban on SA wools) in their market. This mainly affected their broad micron and prem shorn categories. Forward Price Report from Michael Avery (Southern Aurora Wool): Michael Avery Reports another volatile week that saw the anticipated pull back in the spot market realised over the first two days followed by a consolidation in prices on the close. The result for the forwards was solid trading to begin the week then a standoff as the market looked to find a base. Grower participation was light in the prompt months as the dislocation between the current spot auction and the export forward price continues. Growers seem comfortable with short and medium term risk (March to June) while exporters are unable to justify bidding higher when forward sales cannot be executed at current spot levels. Trades were executed in April and May at 2280 for 21.0 microns setting new highs. Bidding remains at 2250 out to June presenting solid hedge levels. Processors are left having to buy hand to mouth to run machinery while not being able to pass the cost of production down the pipeline. The balance of supply and demand is critical with export numbers continuing to fall but production numbers are falling at similar rates. This has caused the spreads between microns to tighten as processors look to fill machinery at the lowest cost. The risk profile remains high. The most pleasing result for the week coming via solid trading levels continuing out in 2020. November and December 2020 for 19.0 traded at 2150. This equates to 85th percentile for the last four years of data. This week’s Auction sales realised $99.27m, taking the YTD value of wool sold to $2,243.53m, an average bale value of $2198.71. Next week the national offering is 46,128 bales up 8000 bales from early estimates. Due to the strong price signals towards the end of this week, I would expect that the price level next week should be easily maintained. 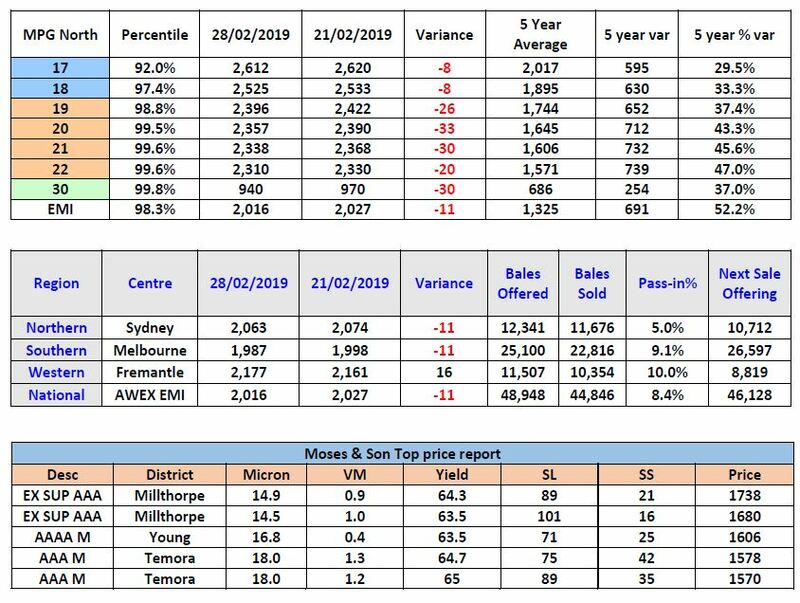 Despite the weekly sales showing some improve over the past two weeks the AWTA statistics for the end of February indicate YTD bales sampled in Australia totalled 1,229,845 down 11.2% with NSW the hardest hit with bales sampled down 16.3%.